Cast Iron Skillet Recipe: Southwest Mac N Cheese With a Zing! Around our house we just love coming up with fun and easy cast iron skillet recipes. This week we are featuring one of my favorite comfort foods of all time. It’s easy, cheesy, and oh so good! Here are some other great dinner recipes you may enjoy…..
Hash Brown Casserole Recipe + 8 Different Ways to Make it! As you can see, we are all about crock pot recipes also! When you have kids it is so easy to throw dinner in there and forget it! 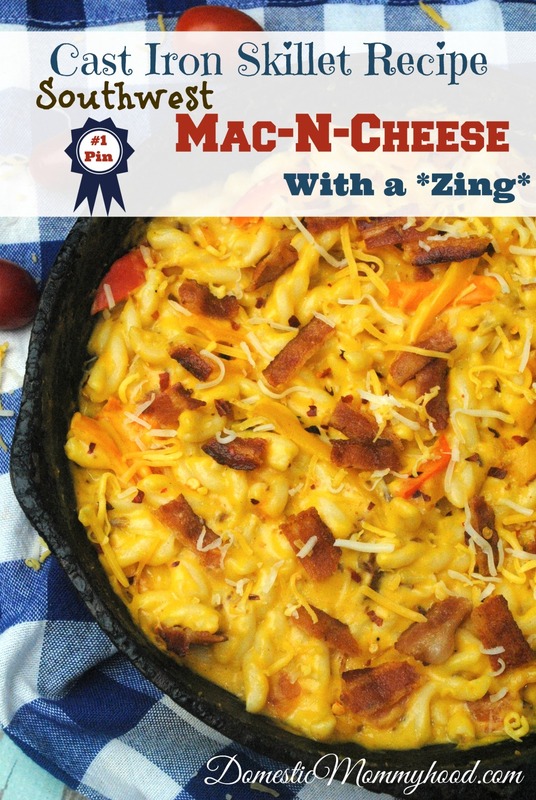 Cast Iron Skillet Recipe: Mac N Cheese with a Zing! Cook bacon as you usually would. Chop peppers and set aside. Cook elbow macaroni and set aside. I always run cool water over mine to stop the cooking process. Others swear this is a bad idea but it works well for me. I hate soggy noodles. In a medium size pot combine milk, butter, seasoning and flour. Cook and medium heat until mixture thickens. Make sure you stir frequently to avoid scorching. Add in the cheese and stir until melted and blended well. Crumble bacon and mix into the cheese mixture, along with the peppers. Spray your cast iron skillet with cooking spray and pour in your macaroni and cheese mixture. Bake at 350 degrees for 15 to 20 minutes or until the top is slightly browned.